1)SIZE: 5.2cm(D)*5.8 cm(H) / 2 inch(D)*2.3 inch(H),Batteries can not be replaced. 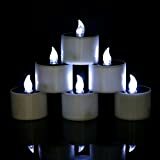 2)PACKAGE INCLUDED: 6x Cool White Solar Led Candles. (Batteries Included,Not Waterproof). 3)TIME: Usually charge 4-8 hours,can use 5-10 hours, but it is up to the power of sun or weather,environmentally friendly. -NOT Waterproof, but you can put candles in a transparent glass jars for outdoor using. 2.Size: Diameter 5.2cm/2 inch+ Height 5.8cm/2.3 inch. Package include: 6 X Solar power LED Candles. 1. These batteries can not be replaced.They are specifically designed for solar charging. And the positive and negative electrodes of the battery have been welded together with the circuit. 2. Charge only when the button is turned ON. 3. Please put the solar panels under direct sunlight. 4. Because the solar panel charging effect depends on the sunlight, LED lights time is affected by the weather, season, location and so on.